Can you believe it's been 23 years since "Aladdin" arrived in theaters?! Yes, folks, it really was 1992 — back when mobile phones were bulky things mainly attached to a cord in your car, back when the only Facebook around was the printed kind you got at the end of every school year, back when CGI 3D animation wasn't even a thing. 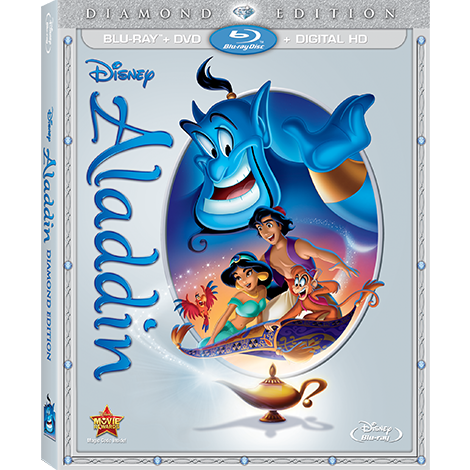 Well, "Aladdin" is back and will now be arriving as a Diamond Edition Blu-ray & DVD ($19.88 on Amazon) on October 13, and CC and I were at Walt Disney Studios this weekend to celebrate. It was actually CC's first time seeing the animated film, featuring a scrappy "street rat," a sassy princess and a hilarious and heartwarming genie, which, by the way, should go down as one of Robin Williams' most iconic roles. I loved re-living the songs with my 8-year-old, who was hearing "A Whole New World" and "Friend Like Me" for the first time on-screen. We even got to see the voice of Aladdin, Scott Weinger (pictured left), who was at the reception and screening to show his child for the first time. How cool is that?! A little piece of trivia I didn't know was that Weinger also played Steve Hale on TV series "Full House," and he'll be reprising his role in the new spin-off "Fuller House." 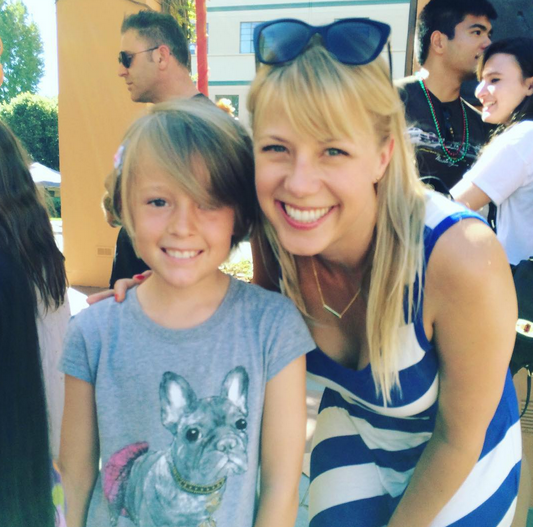 And speaking of "Full House," Jodie Sweetin was on hand with her family enjoying the Disney festivities, too. I was able to grab a photo of CC with Sweetin, and it kind of blew my mind. Obviously, I know time has passed, but it was bizarre seeing her as a grown woman. 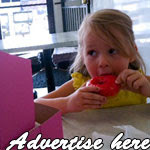 I mean, what happened to that curly-haired little girl who played Stephanie on the show? CC, luckily, held it together better than I did. And yes, she totally enjoyed the movie, especially the genie. CC with Jodie Sweetin, who played Stephanie on "Full House"
If you'd like to catch a screening of "Aladdin," the El Capitan Theatre in Hollywood is featuring the G-rated 2D film now through October 4. For anyone in Los Angeles who loves Harry Potter, 2016 is going to be a very big year. 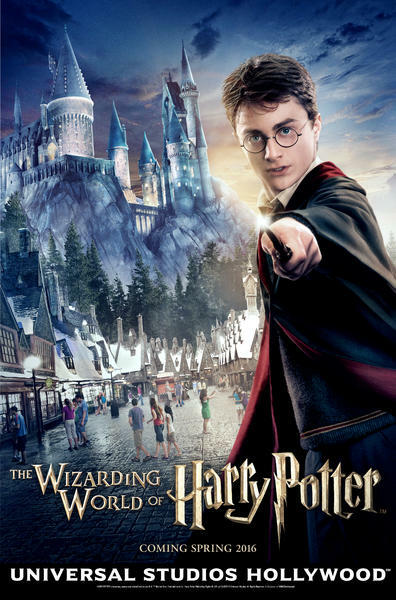 That's because "The Wizarding World of Harry Potter" will be making its West Coast debut at Universal Studios Hollywood in spring 2016. The studio theme park in Universal City just released new art work for the attraction (pictured above), which will feature a replica Hogsmeade village, complete with fun shops, as well as Hogwarts castle and rides and attractions that will apparently make you swear you received your Hogwarts acceptance letter in the mail alongside your credit card bill. 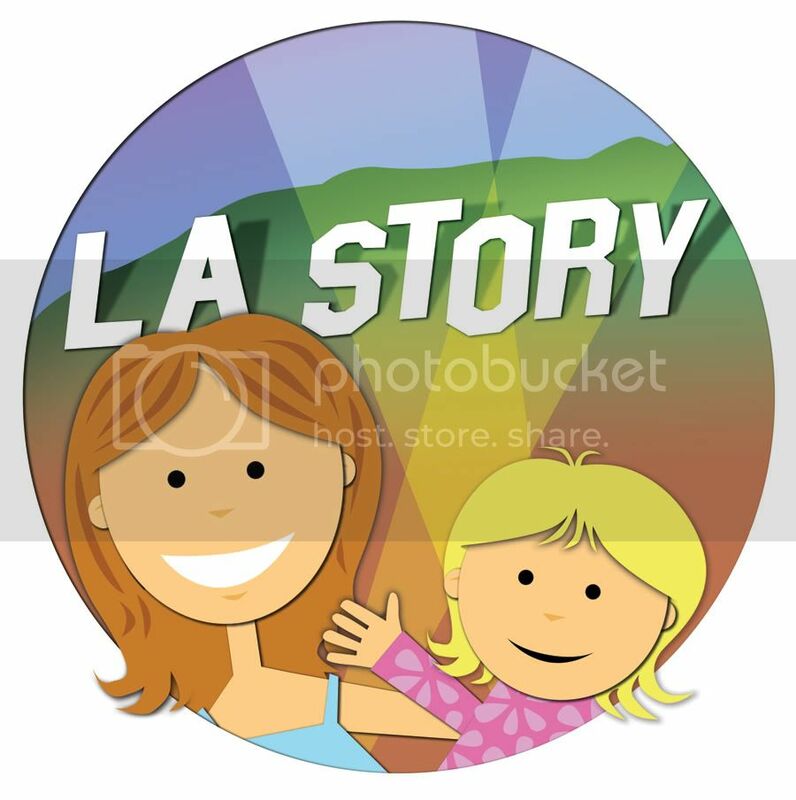 While there's already a version of the attraction at Universal's Orlando location, those of us who haven't made the trip east (ahem) have been counting down the days until we can show this cool world to our pint-sized Angelenos. Stay tuned for more info about the Flight of the Hippogriff, Harry Potter and the Forbidden Journey and the kid-friendly-sounding Frog Choir. 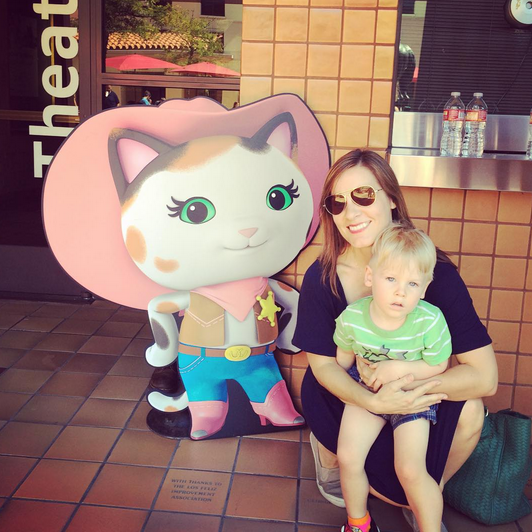 Will and I catch a screening of Disney Channel's "Sheriff Callie" at The Autry. A cute little kitty in a pink hat and spurs rode into the Autry National Center two weekends ago, and Will and I got to check her out first hand. Not only that, but Will was able to cowboy up at the Western heritage museum as well. "Sheriff Callie's Wild West," the hit Disney Channel show, picked up the perfect "pardner" in the Autry. 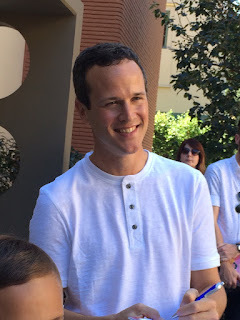 The pair invited little wranglers and their families to come out to the L.A. museum and color, make badges, watch episodes of the show, make music, rope a (wooden) steer and even pan for gold. If you haven't seen the animated series, Sheriff Callie is a sweet and spunky kitty who wants to make sure her town of Nice and Friendly Corners stays, well, nice and friendly. She rides on her trusty horse, Sparky, and hangs out with friends Deputy Peck, a little red woodpecker, and Toby, a Saguaro cactus. The trio solve the town's problems and make sure everyone is doing the right thing by the townspeople. Will pans for gold at the Autry. It's basically adorable, and Will was a big fan of Toby, who kept making sweet mistakes in the episodes we saw. Who wouldn't want to keep a found pair of blue sassy spur-laden cowboy boots even if you later find out they belong to someone else? Well, luckily Toby ends up doing the right thing and giving them back to their rightful owner. 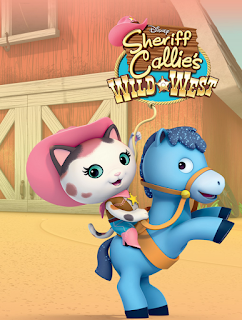 Check out "Sheriff Callie's Wild West" on the Disney Junior block of Disney Channel! If you're looking for a cool night out with the hubs, why not drop by Canon Hollywood to check out an L.A.-friendly photo exhibit from actor/photographer Steve Reisch. 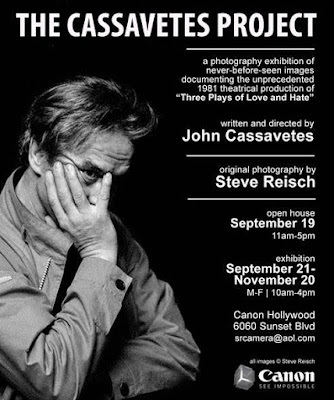 "The Cassavetes Project" will open on September 19 and run through November 20. The exhibit will feature portraits of famous faces including Gena Rowlands, Nick Cassavetes, Peter Falk and even Angelina Jolie as a child with father Jon Voight. Photographer/Actor Steve Reisch first met John Cassavetes in 1981 in the lobby of the Center Theater in Hollywood. Cassavetes was at the small playhouse on North Citrus Avenue to stage "Love Streams," "Knife," and "The Third Day Comes" — a trio of productions the director titled "Three Plays of Love and Hate." Upon meeting Cassavetes, Reisch expressed his desire to document the repertory. Reisch also landed a co-star role in one of the three plays. During the production's six month run, Reisch photographed more than 3,000 behind-the-scenes images with his Canon AE-1 Program camera. His intimate portraits capture the cast and crew, including Gena Rowlands, Jon Voight, Peter Falk, Nick Cassavetes, and John himself. Many of the images have not been seen since June 1981, when the production closed. In partnership with Reisch, Canon has reprinted the images on the Canon imagePrograf 6450 for a special gallery show. The "Curious George" exhibit is coming to Discovery Cube LA on Sept. 19. Everyone's favorite little monkey will be swinging into L.A., this time at Discovery Cube Los Angeles. "Curious George" the exhibit, which kicks off September 19 and runs through January 3, invites kids and their families to explore the neighborhood belonging to that ornery monkey (created in books by Margret and H.A. Rey) and his friend The Man With the Yellow Hat. With fun, interactive displays including a sidewalk produce stand and a (replica) apartment building, kids can use their hands as well as their brains while diving into math-, science- and engineering-based adventures. Kids can sort vegetables at the sidewalk produce stand. At the museum, learn more about Curious George. Find out how the authors saved the manuscript during World War II, and take a look at the history of this historic little monkey. Who doesn't love Curious George?